Years before television, going to the movies was a very special event. Glamorous movie theatres like the Capri at Goodwood made every effort to attract patrons of all ages. Audiences experienced lavish surroundings and enjoyed being made feel welcome. They relished the glamorous and adventurous lifestyles portrayed by the Hollywood stars on the silver screens. 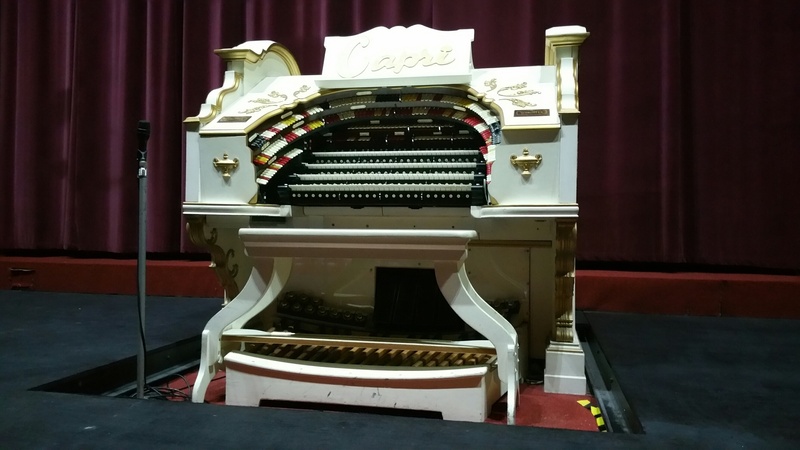 The Capri Theatre is celebrating its 75th anniversary year with a special evening program whereby patrons can experience what it was like to go to the movies at a time when this theatre first opened in 1941. 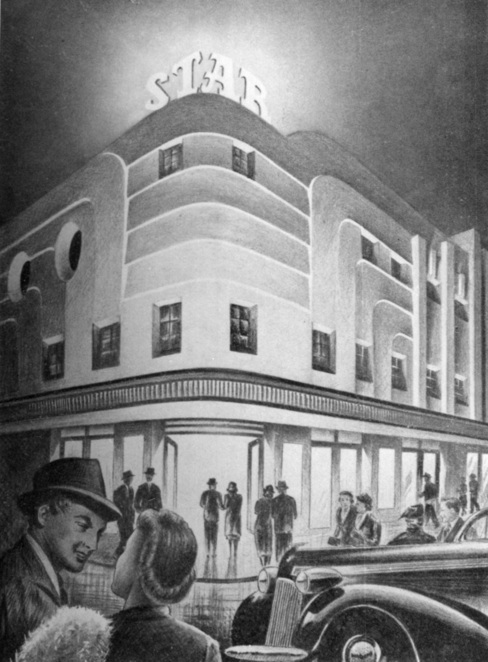 A 1941 Art Decor sketch of Capri Theatre. Courtesy of Capri Theatre. As patrons enter the theatre foyer they will be welcomed by the sound of a piano playing. Patrons will be escorted to their seats by an usher. During intermission the mighty Wurlitzer organ will rise centre-stage and will be played while some old slides from yesteryear will be presented on the screen. There will be tray girls and tray boys serving confectionary and refreshments. 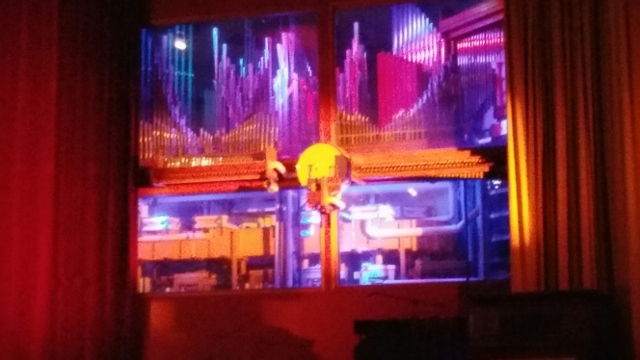 The Wurlitzer Organ at he Capri Theatre Photo: H. Radford. The main feature will be the hilarious black and white, madcap black comedy Arsenic and Old Lace from celebrated director Frank Capra. It stars Cary Grant and the supporting cast also includes Priscilla Lane, Jack Carson, Edward Everett Horton, Peter Lorre and Raymond Massey. The film was made in 1941 but not released until 1944 after a very successful Broadway stage production. 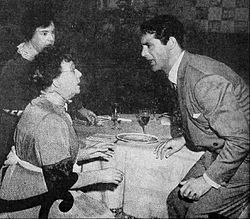 The plot of this classic darkly twisted and macabre comedy revolves around two elderly, eccentric but lovable sisters who raised Mortimer (Cary Grant). The sisters believe they have developed a well meaning habit of terminating the lives of elderly bachelors with elderberry wine laced with arsenic. Just to add to the confusion and humour there are other delusional members of this eccentric family who along with some macabre guests make a very entertaining and funny film. This night of nostalgia will also include cartoons, a war time newsreel and a short film which will be accompanied by the Wurlitzer organ. Why? 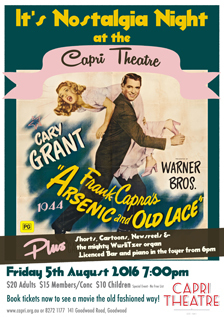 Join the Capri in celebrating their 75th anniversary as they take you back to experience what it was like to go to the movies in the 1940's. Cost: ADULTS $20, SUDENTS $15, CHILD $10, SENIOR $15, CAPRI CLUB $15, CONCESSION $15.